Call me naïve, but I never realized how much driving I’d be doing after my son Mark graduated from the school district five months ago. I have essentially taken over as bus driver. He received terrific travel training at the City Connections transition program. He’s taken dozens of rides on Port Authority buses and ACCESS. But since he graduated, he hasn’t taken the bus or ACCESS even once. Why? Because he needs one-on-one support during the commute. He has a support person who meets him at Community College of Allegheny County for classes, but finding an aide to assist him to and from school on a bus or on ACCESS has eluded us. The driving time to CCAC plus the waiting time involved adds up to at least 15 hours of my time per week. Mark’s supports coordinator told us that we could ask for mileage reimbursement as part of his Independent Support Plan, but I’d prefer getting the time back rather than the reimbursement. I reached out to other families to see if they are facing post-transition transportation issues and what kinds of solutions they’ve figured out. Or not. Rhonda and her daughter Molly were smart to look for a post-transition aide before Molly graduated from school district services this year. Through networking and the help of the City Connections transition program, they found and trained the right person for the job — a retired person who drives Molly (in the family’s wheelchair van) from their northern suburb to Oakland four days a week for volunteer jobs. ACCESS and Port Authority were not viable options for a travel between home and Oakland because of logistics, Rhonda said. Mary Ann and her daughter Nicole have solved the transportation issue by hiring experienced aides who drive the family car to take Nicole to her volunteer job and other activities. Nicole and her aide also use the suburban “park and ride” feature of the “T” for recreation in the city. “The aides do a lot of driving,” she said, adding that the family sets a high bar for safe driving practices. Lynn and her daughter Abby, who live in Butler County, have used a combination of transportation resources since Abby graduated from school district services in 2011. Two of the programs Abby has participated in were in neighboring counties (one in Allegheny and one in Beaver) so she took a taxi to each because the Butler County paratransit system cannot cross county lines. Lynn said the taxi was costly – about $200 per round trip. Although the cost was covered by waiver, a more cost-effective solution would be to allow paratransit to cross county lines, Lynn said, adding that a conversation has begun in Butler County to try to address this issue. Abby just landed a job in Butler County and she will use Butler paratransit to get there. However, because the paratransit ends at 3 pm, another form of transportation will be needed for return trips. 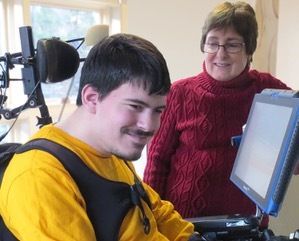 Barb and her son William, who graduated in 2011, have found a reliable method for William to get to his day program: a standing order with ACCESS, which they have found to be very reliable. William also travels with an aide on Uber for appointments and other single trips. The family is looking into using ACCESS for those trips in the future. Candy’s son Colton attends a city high school and is already dealing with complicated transportation issues involving his three jobs in the East End. Candy said Colton is not eligible for ACCESS because he’s been fairly successful on public buses. However, he’s not completely ready to handle problems that might come up when using the bus. The family does a “whole lot of juggling” to ensure rides, and needs to find a better system going forward. Candy would like to find a consistent Uber driver. -Robie’s young adult daughter and Judy’s young adult son use Sierra Transportation (an alternative to Port Authority ACCESS) for their standing-order rides to day programs. Figure out the post-transition realities of transportation before graduation. If using a one-on-one aide, find someone who can drive your vehicle in addition to providing support on site, rather than splitting the job into two. Network hard to find the right person for a job that requires driving a family vehicle. Problem solving is needed to address “crossing county lines” paratransit issues. Port Authority ACCESS is not the only paratransit system covered by waiver in Allegheny County. Sierra Transportation is another. Transportation options like Uber and Lyft are emerging as an alternative to ACCESS for people who can use standard vehicles. For people who have ID/DD waivers, what about a “card” with a set amount of funds for this kind of service (similar to an Medicaid EBT card for food assistance)? A potential niche may exist for Uber or Lyft drivers who specialize in serving passengers with disabilities. Do taxi companies who transport people with disability across county lines charge exorbitant prices for the service because it’s covered by waiver funds? Are there other waiver-covered paratransit services besides ACCESS and Sierra Transportation?